Much individual, group, community, political, national & global unrest gets escalated when collective negative influences reach a critical mass. And these collective influences in turn then affect individuals on a non-conscious level. What Tai Njio does is she clears the negative influences on the collective consciousness level. Here she makes group and global changes by eliminating the weakening influences from 1000's of people at once. Since the Yuen Method principles work on the quantum level, where everything is energy, Tai Njio can create shifts beyond time, space and distance. Thus these PEACE CLEARINGS work on a global level. Join Tai Njio's mission to create peace at the quantum level. You can help by requesting Free Peace Clearings for Global, Humanitarian or specific Group's needs. PLEASE REQUEST A PEACE CLEARING FOR A COLLECTIVE NEED. 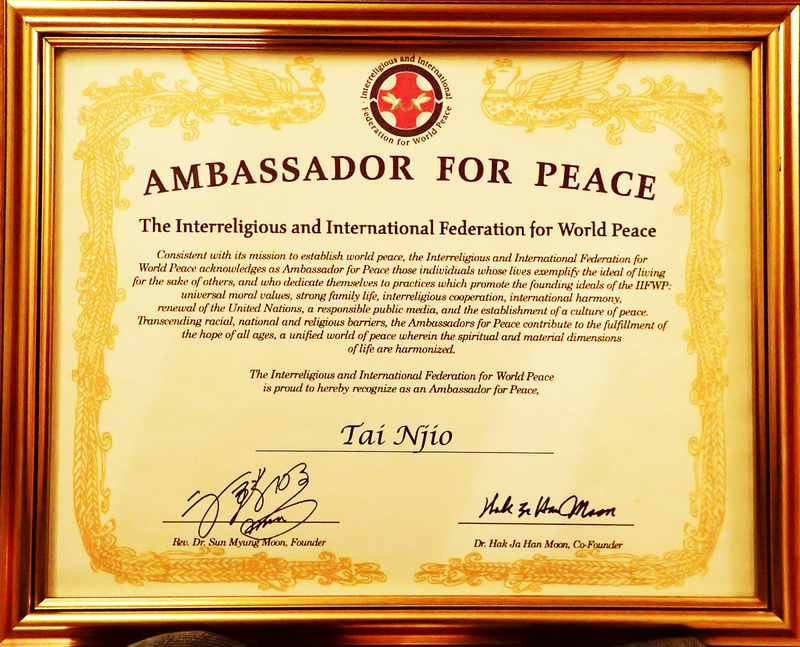 In 2005 Tai Njio has been acknowledged as an Ambassador for Peace, IIFWP Ambassador, by Reverend SUN MYUNG MOON. ​Tai Njio's deepest and truest purpose in life is to create PEACE. She is natural peacemaker for herself, her family, friends, clients, humanity, the planet and beyond. "Tai", her name, literally means PEACE in Chinese.